I'm so excited and honored to be participating in the 3rd Anniversary festivities for CASE Study! Chupa has put together 3 days of fun filled with lots of inspiration and prizes (yeah, I said prizes!). Today is the second blog hop, and the only direction Chupa gave us was to find inspiration, any inspiration! Don't you just love that challenge? I've decided to CASE a past muse and all around fabuloso designer, Laura Bassen. Specifically, I chose this masterpiece of hers as inspiration. Seriously, how awesome is this card? I'm a big, big fan of Laura's work and this is classic Laura:) She has a way of taking basic ingredients and transforming them into something spectacular. Inspired by this awesome card, here's what I came up with! As you can see, I started off with the same Simon Says Stamp Grid Border. The trick to this card was planning and patience. In order to create each letter I needed 5 rows, but the grid border die is only 4 rows. I used a little trick to creating a custom and seamless continuous pattern. To make sure I was perfectly lined up, I used the existing holes and aligned them with the grid. In the picture below, I have 3 rows of the grid matched up to 3 existing rows. So only one row is cut along the top. (Hint: Tape everything together really well before putting it through your die cutter) The additional row is perfectly aligned and looks like it was a part of the original die! To finish the card, I carefully spelled out my sentiment in red and replaced all the extra white squares. Not difficult, just time consuming! And like Laura, I used one of those great Quickstik things. I love those things especially for sequins! That's it for me! Thank you so, so much for stopping in today! And big hugs to Chupa for letting me play along today! The next stop in the hop is the wonderful Cindy Lee! If you get lost along the way, head on over to the CASE Study Blog because you don't want to miss a thing! Thank you for joining us for the Anniversary!! That is just amazing!! When I saw Laura's card the other day - I keeled over! Super job on the Anniversary Blog Hop! Talk about epic patience....such an awesome look! You and Laura are both amazing!! Your card is as amazing as Laura's!! Wow such a masterpiece just like Laura's really beautiful. 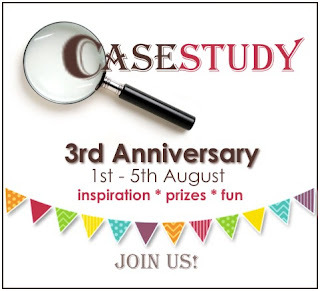 Congrats on the 3th anniversary of case study challenge. Love this blog hop. Awesome card! You and Laura are both amazing! You both are very patient too! 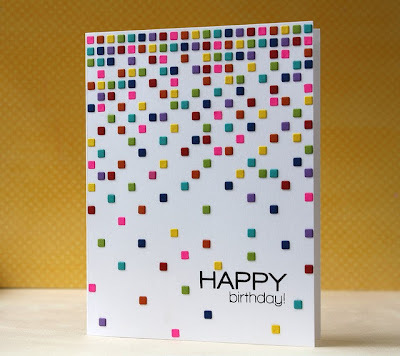 Very clever idea and you must have the patience of a saint to place all those tiny diecut squares. JJ, this is amazing! What an awesome card, and an awesome CASE! Wow! OMG!!! Totally amazing card. And totally amazing how your mind works to come up with these techniques. TFS. And so true what you said about Laura. I love her creations. Awesome card!! Just WOW on the time and patience to put this card together and come out looking so sleek...the little squares are so pristine. TFS!! I applaud your patience ... great card . Very cool card. I love that technique. Super-clever treatment with the grid die, both with the added extra row and with the lettering - great job! This is crafting dedication!! I also loved Laura's card and you did a fantastic take on it. Love it!! Wow! That must have taken some patience! Amazing card! I love Laura's card and you did a great take on it!!! I LOVE your take on Laura's card! Fabulous! Wow! Wold have never thought of spelling words with this die. Fantastic idea! So cool (and gender neutral, too)! Wow! You did a great job!! " Lovely" card! What a fab job JJ! I love your take on Laura's card. Wow - time consuming, yes, but the results are nothing short of FABULOUS! Thanks for sharing and inspiring! Oh goodness JJ.....this is just fabulous! Love your take on Laura's card!!!! Can't say I'm going to try this but it looks awesome! wonderful design and a challenge for me. I'm putting this in my to try pile and when I have time this winter will give it a try. Thanks. Wow! this is just amazing! Another die for my collection!!! What a great card. Love that stamp and how you created the sentiment with it. Oh my!! I LOVE how you did this!! So, so cool!! WOW!!! 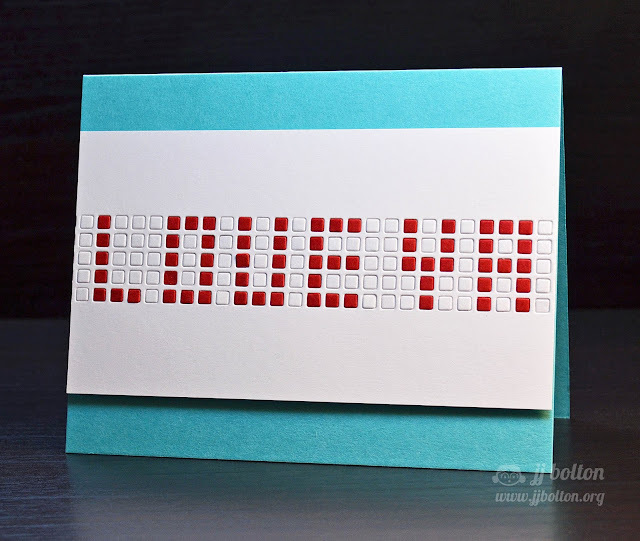 Fabulous card - and what a great tip for extending that die!!! I am head over heels with this card! Beautiful! I was like ~ WOW! So creative ~ Thanks for the tip on extending the die! Great card! Can't believe how much patience that must have taken! Awesome!! I admire your tenacity and it paid off!! Very creative! What a great take on the original JJ! Fabulous use of that die too! I love that border - it is so versatile! Beautiful card and i loved how you cased hers. 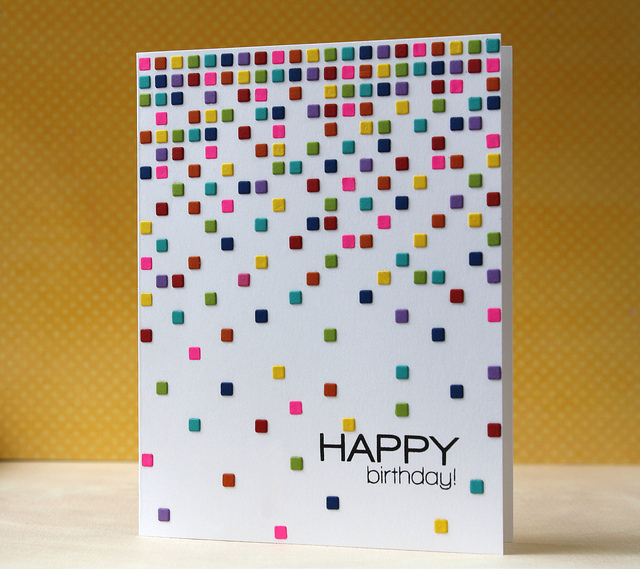 Really nice card--lots of work and precision!! Don't think I could ever master this technique, but I really like it--a fun new idea for me to C.A.S.E. Great CASE of Laura's card, JJ! I love your clever and fun design!!! Very unusual - pretty and different. WOW!!! Both yours and Laura's cards are AMAZING - leaving impressed and inspired as Always - thanks!!! I loved Laura's card, and I think your CASE is amazing! The only "bad" thing is that now I think I really need to own that die. Wow this is amazing and so beautiful. Such a lot of work, but did it ever pay off in the end. I am very intrigued by this die. Great CASE of Laura's card. Amazing work and a great inspiration! Great idea using that red color. It really pops the sentiment. Wow! That's real dedication. I saw Laura's card the other day and was amazed. Today I'm amazed X 2 - Great Job!! Amazing card! I am thinking this took a LOT of patience! Thanks for sharing! Very creative. Thanks for sharing. Would not have thought of it. This is fab! You must have endless patience, but so worth it! Wow JJ! This is genius! Pure CASE genius! This is so cool:) Thank u for sharing this very creativ idea. This i will remember for my sons birthday. Have a Nice day! Wow! What a fabulous card. Love how you wrote out the greeting with red filling. You picked a nice inspiration card. Loved Laura's card and your take on it is so fun! 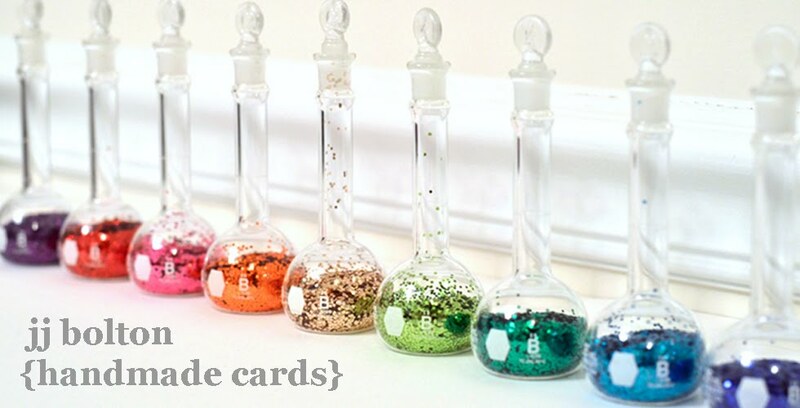 Your take on Laura's card looks just as fun (and just as tedious). Oh my gosh I LOVE this take on her card!!! Fabulous work! Love this so much. Fave. What a great a great take on Laura's card. Thanks for the tips...looks amazing. I love how you interpreted Laura's card. What a great idea. This idea is sooo much fun. Thanks for sharing! Great trick to stretch your border die, JJ. Both yours and Laura's are stunning cards. What better inspiration! What beautiful cards you've created! Thanks for sharing your talent with us! What a fantastic card!! Reminds me of old computers, very retro. It must have taken so long but the finished card is so worth it. When I saw Laura's card I was in awe and then I saw your take on her card and just thought: Genious! I love it! I've been thinking of getting that border die for a while and now you've convinced me. Your card is awesome! Beautiful and creative! Love this Laura-inspired card, JJ! Lots of work, but well worth it in the end! This is fantastic! Fantastic card, and thanks for sharing your secret little technique! Love your card! All that hard work paid off! It looks amazing! Wow - the patience was worth it! Fantastic! wow, I can't imagine how long it took to do this. great job! I love this card of Laura's. Your take is awesome too! Totally reminds me of the first computer type font! I am totally in aw of how cool this is! Oh what a treat! I actually thought of you when I saw Laura's card : ) So glad you picked hers for inspiration ... such a crazy-cool result!! Wow! Your card and the inspiration card are both totally awesome! thats so lovely... I noticed you make something different sort of cards. I love them all. Mostly that chevron colorful card. Wow such a lovely card. I love this die. I like the clean and simple look. What a fun take on Laura's card. Love your CASE of Laura's card! This is absolutely amazing! I love it!!! How cool JJ (of course it is! what else would I expect right?) !! You and Laura have much more patience that I have to craft such wonderful cards, JJ! 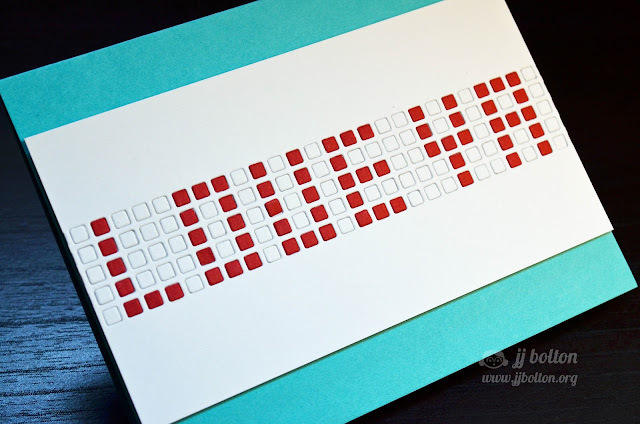 I love how precisely you created your grid/letters! LOVE!! I need to get thiis die! This is such a cool idea. Great card. That die has so many possibilities. Fab inspiration and AMAZING card JJ! This is really stunning project! Beautifully done Case study card creation but boy are you more patient than I am!!! I agree that Laura's card is a masterpiece, but I also love your take on her card. A way to make everything lined up, sign me up! I've been trying to do this by hand it isn't working very well. LOL too shaky. Nice card - Pinterest is going to be getting some "pins" THANKS for the inspirations. Love what you did with your basic ingredients from your inspiration piece, very clever! I am now kicking myself for taking this die out of my shopping cart at the last minute... This rocks!